Editor: We continue our conversation with Tanner about his having come to Christ out of Christian Science last year. In this post he discusses an approach to dialogue with CSers, and an approach to praying for them as well as for ourselves. In earlier posts, Tanner talked here about how he and his wife were converted, and here about the effects of a lifetime in CS. Q: As followers of Jesus, what’s our basis for dialogue with followers of Mrs. Eddy? There is so much potential for dialogue! When I was a Christian Science practitioner the number one question I was asked was, “How can I know that God loves me?” So many people really resonated with what I was sharing with them about grace. People are hungering for that message. As soon as I converted, most of those open doors slammed shut. However, I know that that message resonated with so many people, and I think it still is resonating with them. The Holy Spirit is pursuing His people, and He will bring them to Himself. 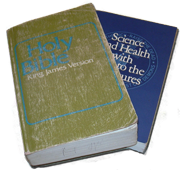 Many people think that they can have both Christian Science and the message of the gracious love of God in Christ Jesus. But my experience has shown that isn’t the case. No man can serve two masters. Ultimately there will come a point when we have to choose between the Jesus of the Bible and Mrs. Eddy. I have had loved ones say that they are choosing Mrs. Eddy over Jesus. They do not realize the implications of that choice – but at least they know they are consciously making that choice. Tragically, most Christian Scientists don’t recognize that they have to make that choice. They are unaware that the “Jesus” whom Mary Baker Eddy presents in her teachings is simply a mirror of her own mythic self-conception. In her version of Jesus, he was a great healer and teacher, with a unique divine origin. He was persecuted and ultimately crucified for teaching people how to heal. This just reflects how she apparently saw herself. Since most Christian Scientists were raised on this unscriptural caricature of Jesus, and have never seen the actual biblical Jesus, they naturally view Mrs. Eddy’s life and character as parallel to his. Thus they think that, in many ways, Jesus was the first Christian Scientist. When they are presented with some of his sayings that don’t accord with Mrs. Eddy’s teachings, they say we have to take “the inspired word”, or the text was corrupted, or we have to take it spiritually instead of literally. By which they tend to mean, we have to allegorize, rather than taking Jesus and his words as his followers would have understood them, did understand them at the time, and have understood them for 2000 years. At some point, if the Holy Spirit is working in them, they will realize they are choosing Mrs. Eddy instead of Jesus and that they have been standing in rebellion against the real Jesus, the one the gospels reveal. So is there room for dialogue with Christian Scientists? Yes, absolutely. It starts with the fact that most Christian Scientists do think of themselves as Christians. They certainly think they are following Jesus. And they certainly think that they are following the Bible. But the conceptions of God in biblical Christianity and in Christian Science are so fundamentally different that it isn’t just that one group or the other is missing a key component. Rather they can’t both be talking about the same God. The trinitarian God of Christianity cannot be the same as the Father-Mother and synonyms of Christian Science. Cannot! And there are so many other places where the Christian Scientist and the Christian disagree on the meaning of words: God, Christ, Jesus, Holy Spirit, creation, forgiveness, mercy, grace, love, resurrection, inspiration, angels, heaven, hell, sin, baptism, eternal life, atonement, salvation, prayer… and the list goes on. Of course, there is a lot of disagreement amongst Christian Scientists about these ideas as well. I found, as a Christian Science practitioner, that I had to do a lot of listening to people to figure out what they meant by different terms, because they may have meant them in a very different way than the last person with whom I spoke. It will also require a lot of prayer and patience – for only the Holy Spirit can open hearts and minds to hear the gospel. Without the work of the Holy Spirit bringing about our conversion, we all stand in rebellion against the living God. Bluntly put, our Christian Science friends despise the God of the Bible, though they don’t realize it in the least. By this I mean that implicitly, though not in so many words, they despise (literally, look down upon or scorn) a good creator God who made the universe we see, a wise God who gave us every word of the Bible and meant every word that He said, a holy God who has wrath and a chosen people, a God who saves by grace instead of through our own merit or understanding. They unwittingly hate this message – as at one point, so did every sinner who has been saved by the grace of God. But ultimately the Father, the Jesus Christ, and the Holy Spirit of the Bible is far more beautiful, good, and true than the pale counterfeits offered by Christian Science. And we can pray for our friends and loved ones (and for all Christian Scientists) that they will come to see the beauty and truth of the God of the Bible. I’ve thought, in particular, about that last point – about showing the attractiveness of the gospel to people. The gospel is attractive. There is no message more beautiful, more freeing, more satisfying. The challenge for us is to speak in such a way that Christian Scientists can hear it – to help them see its beauty so that they will wish it were true. And then, through the power of the Holy Spirit, we can show them that it is! Above all, we must keep loving them, recognizing we would be in the same place they are were it not for the grace of God, and we must pray for the Holy Spirit to open those doors. Q: Speaking of prayer, how should we be praying for ourselves as former Christian Scientists who are now baptized Christians? Our Father is wise and good. His plan for our lives is for our good and for His glory. And so I pray that I live more for His glory. As I have been thinking about my history as a Christian Scientist and my new life as a Christian, I keep praying that my life be one that glorifies Him in whatever way He chooses. While I would love it if that means our testimony helps bring others to Christ, He may have an entirely different purpose for my life. It has certainly given me such an overwhelming gratitude for my salvation and love for the truth. I know that other Christians in our church have been encouraged by our testimony. If nothing else, I pray that our testimonies glorify our Father, in His wonderful goodness, justice, and grace. The author of Hebrews tells us to keep looking to Jesus, the author and finisher of our faith. (Hebrews 12:2) As Scottish pastor Robert Murray McCheyne (1813-1843) once said, “For every look at yourself, take ten looks at Christ.” The point is, to keep our gaze always fixed upon our Saviour. I find myself frequently praying that I be moved to a greater and deeper love of our Saviour. Every day we should find new mercies in the wondrous love of Jesus. It’s easy to identify ourselves as “former Christian Scientists.” And that is something that is a part of our history. But we need to make sure that we are always finding our primary identity as the redeemed of the Lord. We are members of Christ’s kingdom because of what He has done for us. It is tempting to look at how great our problems are – but we have to remember how much greater, infinitely greater, is our Saviour and the salvation that He has freely given us. I also find that it is important to keep praying that the Holy Spirit uncover the patterns of thought or conversation or prayer that aren’t true or honoring God. The Spirit is good at that! And through His power, He can set us free from those patterns and lead us into all truth. I’m not saying that all the problems stemming from someone’s decades in Christian Science will be wiped out overnight. (See my previous post on this.) But we have a real God who really does heal – and He will make all things new. He will recompense every pain and heartache. I would also encourage fellow former Christian Scientists to not just be praying for ourselves. It is important to avail ourselves of the means of grace that God has given us. We need to be in the Bible, studying and growing. We do need to be praying for ourselves continually. But we also need to be a part of a good solid church. We need to partake of the Lord’s Table. And we need to find good friendships with fellow believers. The tendency in CS – and in much of American culture – is to think of religion as something purely private. But our loving Father calls us to be a part of his family. We are to be brothers and sisters in Christ together. You are not alone. Even if there are currently no former Christian Scientists who are now Christians around you, there are many that are just an email or a phone call away. Q: Thinking of someone we care about who follows Mrs. Eddy, how might we pray for that person? It’s tempting to think, “If only they knew these facts about Christian Science” or “If only they could understand this about Christianity” that they would come to Christ. That perspective is, in some ways, a holdover from a CS perspective, where ignorance of spiritual truth is man’s chief problem. It’s ultimately a gnostic belief – an assumption that spiritual knowledge and understanding is the key to salvation. The Bible shows us again and again that our chief problem is sin – and particularly an unwillingness to yield to God as Lord over our lives. So it is the conviction of sin that will ultimately bring people to see their need of Jesus as their Saviour. The gospel alone is the power of God unto salvation. Our loved ones are not going to be saved through an argument or through examining the historical record of Christian Science. God might use those means – but the only thing that saves is the gospel of Jesus Christ. So we must pray that our loved ones will hear the gospel and see its beauty and its truth. God is perfectly holy, and we are not — we have all sinned and fall short of the glory of God. How can we possibly stand in the presence of our perfectly holy God? Christ Jesus lived a perfect life, one of complete righteousness, and on the cross He bore all of the sins of all of his people throughout all time. God laid upon Jesus our sin and iniquity. And through faith in Jesus, He gives to us His perfect righteousness. And through faith in Jesus we enter into a relationship with our Father as His beloved children. This beautiful message causes our hearts to be at rest and to be at peace. Even amidst trials, we have an unchanging rock of our salvation, and the beautiful promise of eternal life with Him. I have so many friends who work at The Mother Church, at Prin, at the summer camps for Christian Scientists, or are practitioners. They are all such dear people. They are hard-working, devoted, and think that they are genuinely serving God. They are trying desperately to make it work – trying desperately to have the church that Mrs. Eddy established fulfill what they see as its God-appointed mission. And yet, it clearly isn’t fulfilling the prophecies she made for Christian Science. The movement is shrinking, despite all efforts to the contrary. The periodicals all lose money, when Mrs. Eddy set them up so that they would give money to the church. And because these devoted CSers are certain that what Mrs. Eddy established is of divine origin, and that our works can contribute to our salvation, they think that they just need to be working harder. They blame themselves – consciously or unconsciously – for the failures of the movement and for not getting the healings they are seeking. “Mrs. Eddy can’t be wrong,” they tell themselves. “It must be my fault. I must be doing or thinking something wrong.” Revealingly, this is the classic language of someone in an abusive relationship. And so these faithful ones will work themselves to exhaustion, they will try whatever innovations they can, hoping that this time it will work, and they will continue to ultimately blame themselves and rededicate themselves to Mrs. Eddy’s writings and working harder or giving a better treatment – thinking that maybe this time they will find their healing or grow the church. So in praying for these dear ones, we can pray that God will end what is in effect a cycle of abuse – that God will set them free from the years of guilt and shame, inadequacy, and exhaustion. We can pray that they can find the rest for their souls that only comes through Jesus. Here again, as a Presbyterian, I am showing my Reformed theological views of how someone is saved. But, I firmly believe that it is God who brings about our salvation, not we ourselves. God is pursuing His people, and He will bring them to Himself. He won’t fail in that. He can’t fail in that. This recognition brings us tremendous assurance and freedom, but at the same time, it doesn’t relieve us of the desire and the need to be praying for our friends and to bring them the gospel message when we can. God is relentlessly pursuing his people and bringing them into His kingdom. And nothing can stop that. Our lives as rescued ex-CSers bear witness to this. So do the lives of former Mormon missionaries who converted while on mission, Muslims in Iran and Saudi Arabia who knew nothing of Jesus but had dreams of him calling to them and they converted on the spot, or members of the underground churches in China quietly evangelizing their neighbors and bringing them into His kingdom. God will pursue His people, He will triumph. That includes delivering His loved ones now following Christian Science. Aslan is on the move.